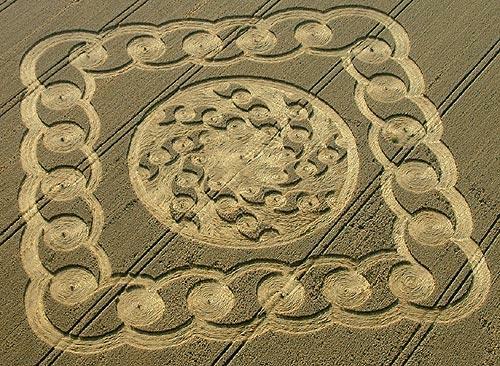 The July 21 Hackpen Hill circle shows Planet X in the Ying-Yang symbol in an increasing size ratio. Visual sighting reports show the a Planet X persona Occulting the Sun almost completely. Tonight here in Canada I watched the sun set behind Planet X, I watched through my binoculars from the other side of the lake. Planet X was super orange so I could look right at it. I watched the sun set into it from the top, leaving Planet X as the sunset. It it was freakin huge. [and from another source] This evening [Feb 19] at work at approx. 5:45 PM in Ohio I saw a double sunset exactly like the two Lake Erie photos on the ZetaTalk website. It looked like one very large orange sun setting on top the other as sun went down. You could see the curve of each where they touched together. [and from another source] Today [Feb 19] on the Regional TV news here in Italy, the speaker talked about that a large shadow is at the moment in front of the Sun and is getting larger. Though not recognized at the time, the 32 balls around the outer circle, with an average of 11 balls for each span between Ying-Yang symbols, is Significant for a revesed orbit of Earth. The Sweeping Arms affect Earth 8 times as it moves forward in its orbit, but there are for this orbital period an additional 8 Earth has chased in front of, 16. 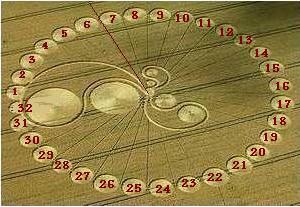 In a reversed orbit, the Earth would encounter 32 sweeps, as it backs into these arms. Divide 365 days in the year by 32 sweeps and the average period is 11.3 days between sweeps. The disproportionate size of the balls in the outer circle would indicate not all sweeps are the same size or time span. On Mar 10, this observation was made for the Southfield Circle, the basis of the Sweeping Arms analysis. 8 arms * 4 balls = 32 sweeps. Just noticed the eight sweeping arms in the Southfield Circle contain four balls in each arm - thirty-two balls - thirty-two sweeps. Same number as in the perimeter of Hackpen Hill.